Home of the Legendary SPARTAN Camshaft!! Our Custom Forged Pushrods Required if installing in 5.7. 6.1 can use stock rods and springs and works well with stock retainers too. Stock pushrods fine on the 6.1 or you can upgrade to Forged Rods. See webstore. 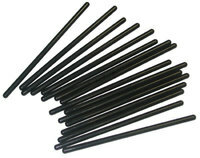 Our Custom Forged Pushrods Required if installing in 5.7. 6.1 can use stock rods and springs and works well with stock retainers too. See webstore. We're proud to be the first (and still only!) aftermarket performance company to release camshaft options for the 3.5L HO V6 Chrysler motors and we have had great success with these over the years. Pricing is $375 for these cams. There is a $200 core charge that will be refunded once your stock cams are sent to us. *IMPORTANT* Due to poor camshaft availability (engine now out of production), we can ONLY do these if you source a set of cams and them them to us to be ground. Otherwise wait times will be months, not weeks, unfortunately. These one piece, custom forged pushrods are not only stronger, but also sized based off of our camshafts' base circles. 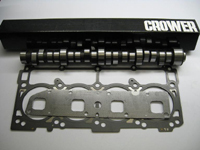 These will help remove slack from your valve train and there by lessening excessive valve train noise commonly resulting from aftermarket camshafts. 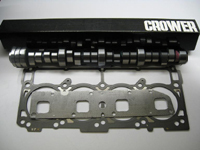 These are recommend for camshafts with durations of 218 duration or more, tight LSA's or with lifts above .550. 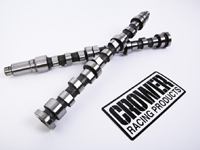 This adjustable timing kit from Crower allows you to adjust your camshaft's intake center line. The kit comes with the pre-made bushings to advance or retard your cam 2, 4 or 6 degrees. 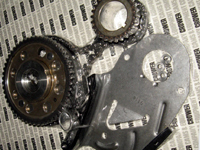 Rear wheel horsepower (RWHP) and torque (RWTQ) results are based off customer results following tuning. Individual results may vary depending on supporting modifications and air quality at the time of testing. Copyright © 2008-2013 InertiaMotorsports.com. All Rights Reserved.